NOW AVAILABLE ON I-TUNES and CD BABY. Volumes 1, 2, 3, and 4 are currently on I-Tunes, search "john behnke". I don't get tired of listening to them." 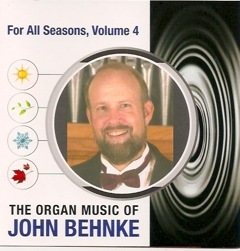 A 60+ minute digital CD featuring the "Organ Music of John Behnke." The price is $9.99 to download the entire CD, or .99 per selection. 5. Prelude on "Tempus Adest"
A collection of hymn-based organ settings by John Behnke. Recorded on the 3-manual, 63-rank Steiner-Reck Chapel Organ in the Chapel of Christ Triumphant on the campus of Concordia University, Mequon, Wisconsin. For All Seasons, Volume 4 NOW AVAILABLE!